Situated in the heart of the city on Sathorn Road, the Blue Elephant Restaurant is elegantly lodged in a historical building dating back to more than a century, offering an elevated experience in Thai cuisine that you must be sure not to miss as well as to enlighten your Thai cooking skills in its culinary school. mylifestylenews writes. Eating authentic food is always an imperative when travelling to exotic locations and Thailand is no exception. The local food can be incredibly memorable with touches of spices and piquant flavours that are not always spicy, but really hit the mark. There is high-end local food and street level food that can leave you wanting more, but for this trip to Bangkok, we decided to try a perennial favourite with foodies, as the Blue Elephant Restaurant is such a classic establishment that uses the highest quality ingredients from Thailand as well as a few other carefully picked ingredients from around the globe with most recipes derived from centuries old recipes that were faithfully handed down through generations and a few other new, creative and unique variations on traditional themes. The Blue Elephant Restaurant story began with Chachoengsao province born Chef Nooror Somany Steppe who ingrained her deep connection with the culinary world since childhood by her mother who had a vast knowledge in making fresh, fragrant curries such as her famous heirloom Massaman curry paste. Chef Nooror became married to a Belgian art dealer, Karl steppe, who has always been passionate about Thai culture and Thai cuisine. The founding of Blue Elephant Restaurants was prompted by her preparations of homemade Thai meals for her husband’s guests who were enchanted with her cooking skills. The first Blue Elephant Restaurant opened in 1980 in Brussels, Belgium and continuously expanded throughout major cities in the world and later returned to its homeland and established Blue Elephant Restaurant and Cooking School Bangkok in 2002, and opened a Phuket branch in 2010. The Blue Elephant Restaurant Bangkok is housed in the colonial era architecture. Thai-Chine Building of the Thai Chinese Chamber of Commerce, whereas the Blue Elephant Phuket is located at the site of the Sino-Portugese Phra Pitak Chinpracha Mansion. The maison is a well established landmark built in the old colonial style with high ceilings and floorboards, and is so eye-catching it cannot be missed when you are passing on the local BTS, or driving along Sathorn Road. The architecture of the building is a standout amongst all the new apartment and office blocks that have sprung up over the years. 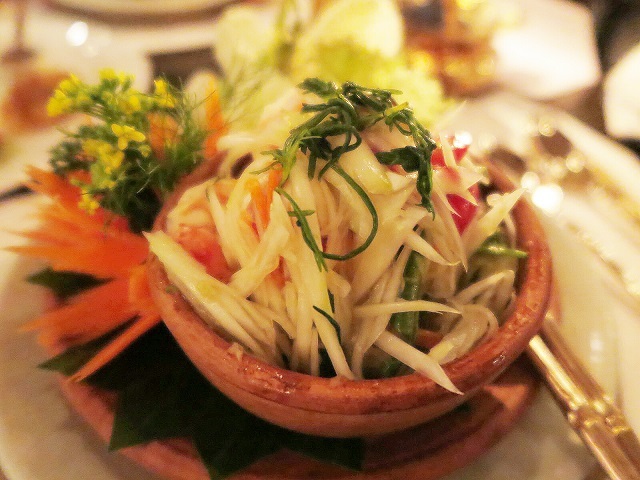 Blue Elephant Restaurant pride themselves on offering Royal Thai Cuisine, so all your favourites will be there, as well as some novelties – after all, Thai cooking has not stopped evolving. On entering the reception area, you are immediately taken aback by the dining room that unfolds before your eyes, as this gives you a feel for yesteryear and transports you away from the buzz of modern Bangkok. The tabletops reflect the colonial style of the building, setting the scene in a very classic way for a special evening. Choosing your journey of Thai food for the evening is not an easy task, as there are so many favourites that caught our attention, so we opted for the set menu of Pearls of the Blue Elephant and added some extra dishes so we could experience the breadth of cooking styles. 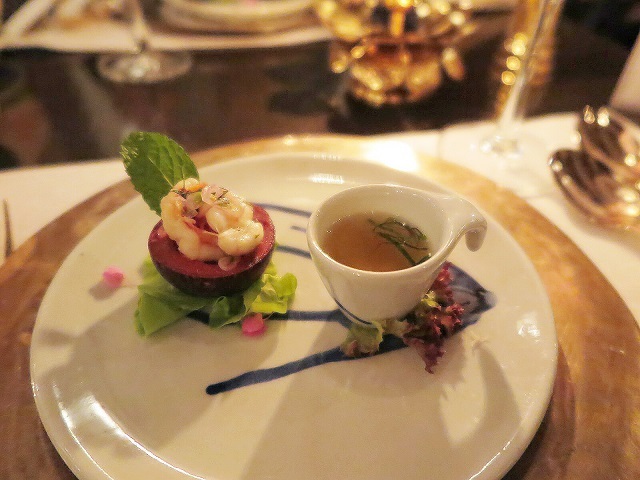 An amuse bouche kicked off the evening with a spicy <Mangosteen Prawn and Lemongrass Soup>. These mouthfuls were a nice precursor to the evening with delicate but distinctive flavours to enliven the taste buds. 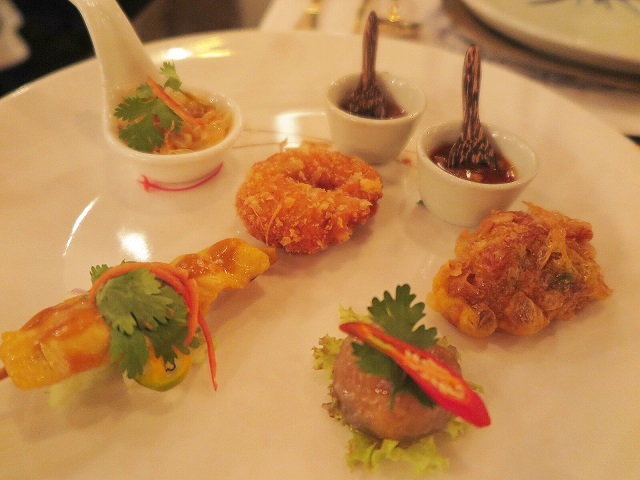 We began with an interesting and delicious selection of <Blue Elephant> ancient Thai starters and salads (4 items). This consisted of “Nakorn Chaisri” Crispy Tiger Prawn Cake with a hint of organic Thai garlic and a side of refreshing organic “golden honey” pomelo salad. ; marinated organic Chicken Satay strip served with homemade peanut sauce and mini cucumber salad; Steamed Chicken Dumpling with exotic stuffing and Crab Miso. The crab was not that obvious, and the chicken satay was a bit dry but the prawn cake had a great crispy texture so was the dumpling with complex flavor. The only downfall for this starter was every mouth full item was being served in a singular portion, if you intend to share the plate, a second order perhaps is needed. This spicy green papaya salad with fresh prawns and Chakarm leaves from Ampawa Floating market was not as good as expected. The sauce was rather too sweet and monotone, lacking of the complexity in taste yet empowered the freshness of the papaya salad. Excellent flavor in this creamy and less spicy sour soup and a very generous serving of Andaman Tiger prawns with straw mushrooms that surely had spiced up the culinary journey of our evening. 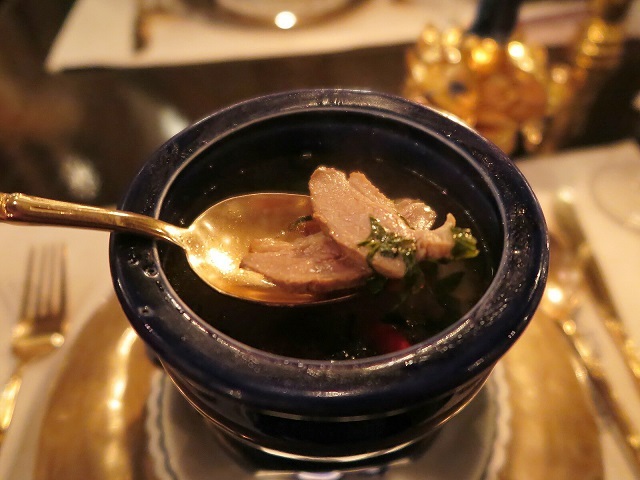 Free range ducks are used in this spicy and sour soup with Jingjuchai and Ratchaburi honey glazed lemon slice. Simply delicious and spicy on the palate that gives a refreshing yet little kick in the palate. A must try! 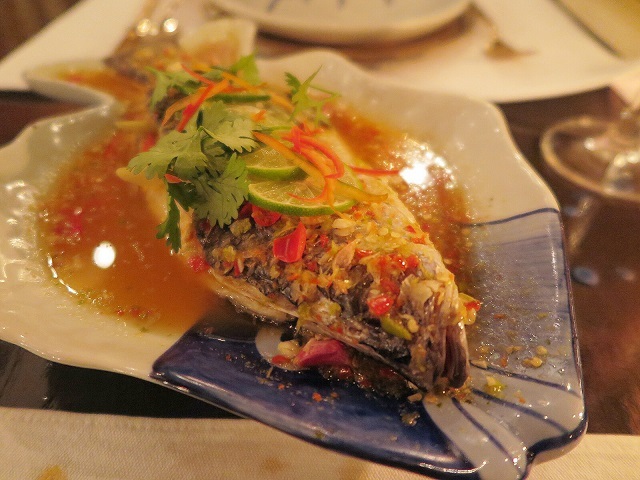 A whole steamed sea bass prepared in Thai herbs, bird’s eye chili and pickled garlic-honey dressing. This dish was perfection with beautifully judged flavours and balance in the handling of ingredients. One of our all time fish dishes when it comes to ordering Thai food. This world renowned dish was created during the second world was in the period of prime minister general Por Phiboonsongkram. 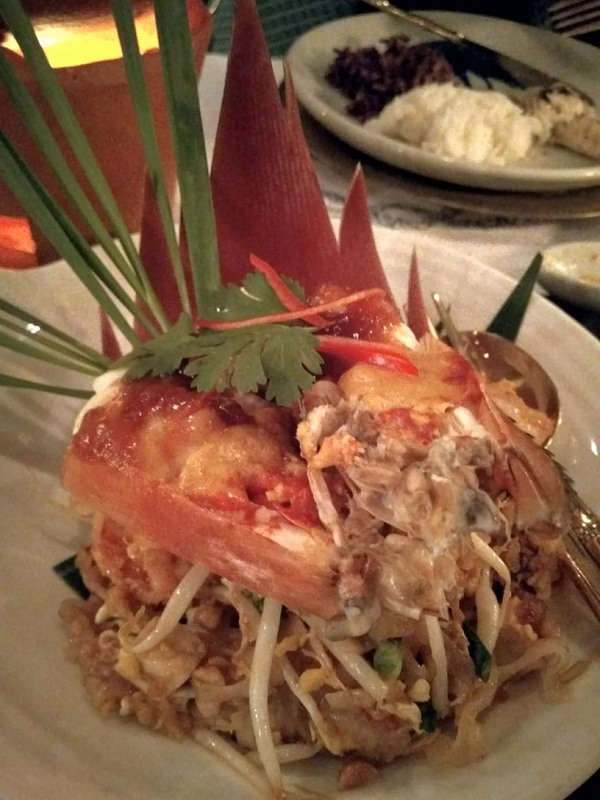 Fresh giant river prawn and tiger prawn with “Chantaburi” rice noodles are used. Quite high in cost yet not to compromise in quality by also using organic egg, ground roasted peanuts, tamarind and banana blossom as garnish. This is another classic dish that shall not be missed. 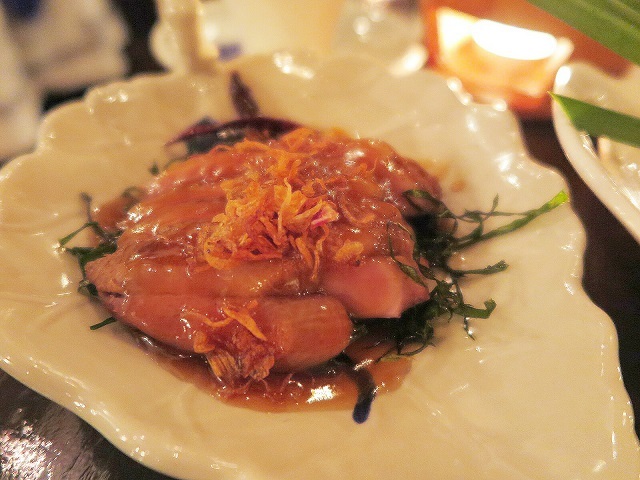 The dish is centred around free-range duck breasts that are marinated and seared to perfection with a tamarind sauce glaze and crispy kale. It was superb overall with the tenderness of the breast meat which exuded lively, spicy flavours that were to be savoured. 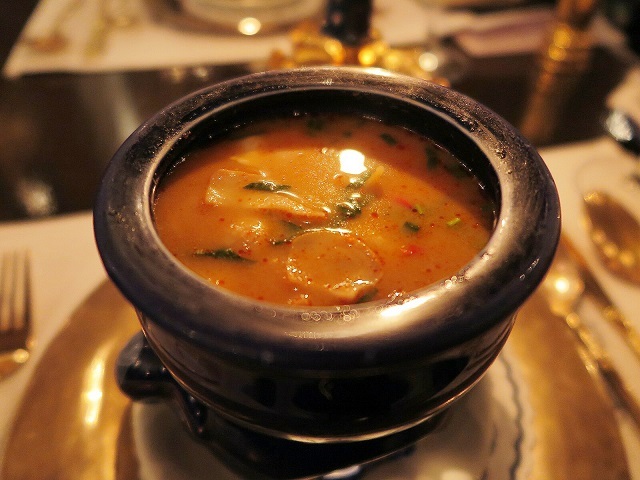 Chef Nooror’s bespoke signature curry inspired from the poem of king Rama II. This signature dish did not disappoint. 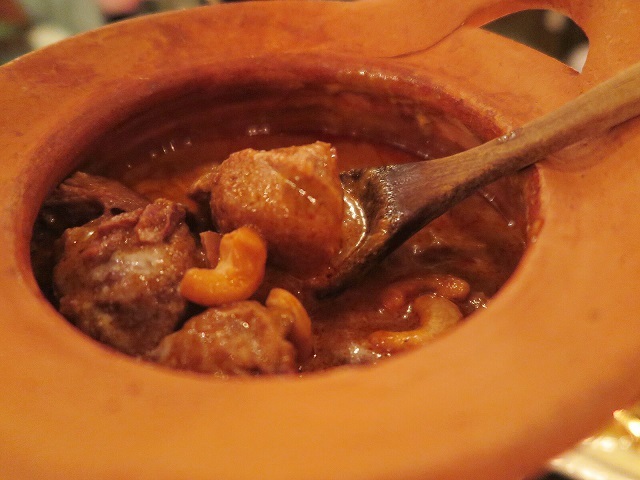 The succulent Australia lamb meat was so tender and everything seemed to be balanced in flavor and texture. The Massaman curry paste in coconut milk, tamarind juice, palm sugar, sweet potatoes and roasted nuts was unctuous and on point and not a drop was left especially as it was served with roti. 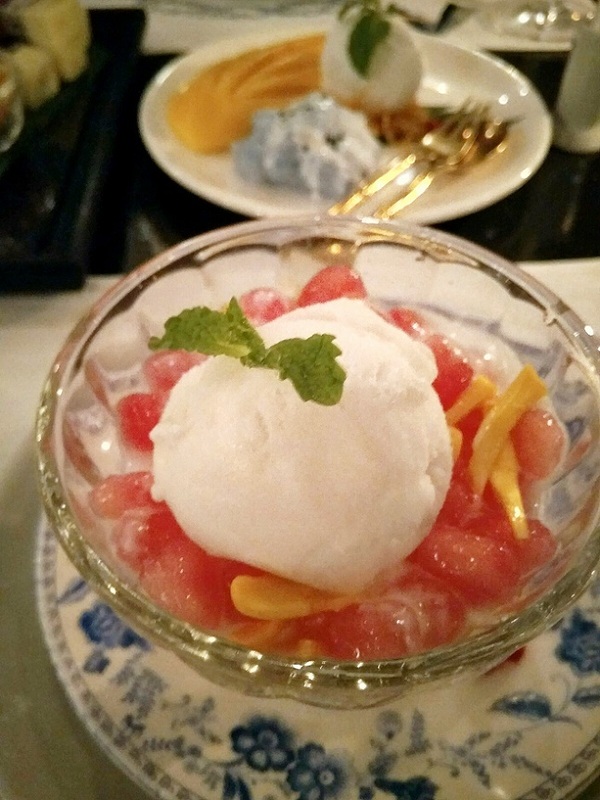 You can hardly say no when it comes to Thai desserts, with so many delicacies that can really sweeten your taste buds at the end of the meal especially the ruby water chesnut covered with tapioca flour in coconut milk, shredded jackfruit on the side and topped with a cold coconut ice cream. This was simply delightful. The mango sticky rice is no stranger to anyone but in Blue Elephant Restaurant, the sticky rice was naturally colored with butterfly pea flowers that gives a more sophisticated presentation. The food came out at the right pace to begin with, but then all the main courses came at once, so we felt inundated with too much at the one time, but there was so much to enjoy, with abundant flavours. The service from the Manager was very attentive and engaging and made our evening, as we asked a lot of questions about the menu, to ensure we made the right choices, plus he suggested a wine pairing, which hit the spot, given that so many dishes can be difficult to match with wine especially when it comes to Thai food with so many different levels of complexity. There is so much more to this fine establishment, with the famous Blue Elephant Bar on level one for a pre or post drink to admire the architecture and the décor of the entire mansion is somewhat relaxing and pleasing to the eyes for its vibrant design. In promoting Thai Kitchen to the World for more than 35 years, Chef Nooror was awarded an honorary Master of Arts degree from Kasetsart University. She continuously aims to provide the pinnacle of Thai cuisine exquisitely prepared from fresh, local ingredients, organic foods and products from Royal projects, her curry pastes are all Halal certified. Today she exports her handmade curry pastes in more than 35 countries worldwide, she strictly forbids the use of Monosodium Glutamte (MSG) in her kitchens. There is a little retail shop as you enter off to the right, so memories don’t have to be left once you leave, as you can buy some souvenirs to take home as well. It can seem a little touristy, but the food speaks for itself and there is definitely some great talent in the kitchen that makes for a beautiful journey of Thai food.